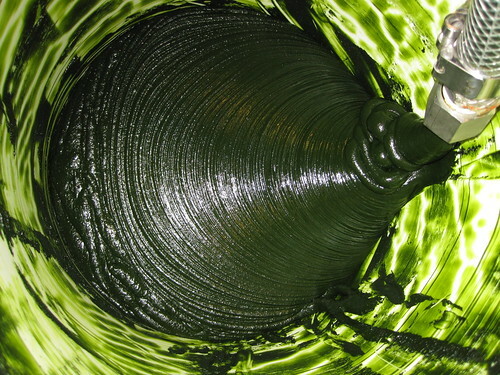 Algae was used as the feedstock for the hydrothermal liquefaction process at PNNL. After conversion at PNNL, algae are separated into biocrude (top black layer) and aqueous waste water. RICHLAND, Wash. — Researchers at the Department of Energy's Pacific Northwest National Laboratory have created a continuous thermo-chemical process that produces useful biocrude from algae. The process takes just minutes and PNNL is working with a company which has licensed the technology to build a pilot plant using the technology. 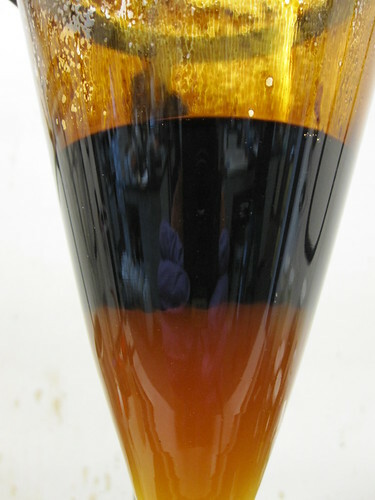 The first part of the conversion process, hydrothermal liquefaction, creates biocrude that can be upgraded to produce fuels such as gasoline, diesel, and jet fuel. It also produces a by-product wastewater stream which includes carbon and nutrients from the algae. A partnership with Washington State University researchers at the Tri-Cities campus led to a means of converting the wastewater stream, to a bio-based natural gas. In this process, any remaining solid material can be further recycled into the hydrothermal liquefaction process or converted to an agricultural fertilizer. WSU researchers are using anaerobic microbes — those that don't need oxygen — to break down the residue in the wastewater. Having a viable way of dealing with the wastewater enhances the commercial viability of creating biocrude from algae or even sewage sludge as demonstrated by PNNL. The wastewater project, described in a WSU news release, was recently published in Bioresource Technology.